Depression and memory: Are impairments remediable by attentional control? People who are in depressed mood states or who are formally diagnosed as clinically depressed frequently complain of impaired memory. 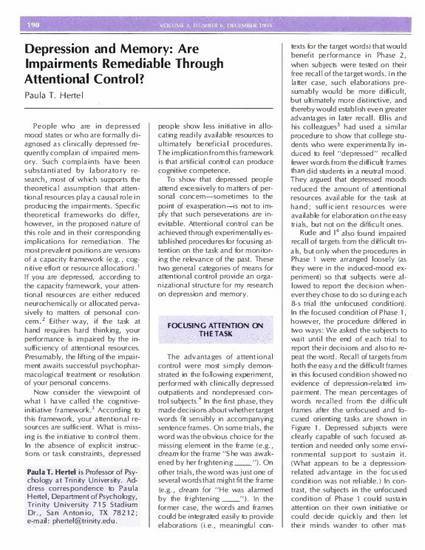 Such complaints have been substantiated by laboratory research, most of which supports the theoretical assumption that attentional resources play a causal role in producing the impairments. Specific theoretical frameworks do differ, however, in the proposed nature of this role and in their corresponding implications for remediation. The most prevalent positions are versions of a capacity framework (e.g., cognitive effort or resource allocation). 1 If you are depressed, according to the capacity framework, your attentional resources are either reduced neurochemically or allocated pervasively to matters of personal concern. Either way, if the task at hand requires hard thinking, your performance is impaired by the insufficiency of attentional resources. Presumably, the lifting of the impairment awaits successful psychopharmacological treatment or resolution of your personal concerns. Hertel, P. T. (1994). Depression and memory: Are impairments remediable by attentional control? Current Directions in Psychological Science, 3, 190-193.